At the center of the Auditorium Theatre’s mission is our commitment to the ongoing restoration and preservation of the National Historic Landmark Auditorium Theatre. Here you can learn more about our current restoration and preservation efforts. Stenciling restored in the North Inglenook. In 2014, with the help of the Efroymson Family Fund, we began to renovate and restore our second floor dress circle lobby, now The Elissa Lobby. This interior — spanning 12 ceiling bays and 2 fireplace inglenooks — was originally designed by the now-legendary architect Louis Sullivan. During the process, our historian Bart Swindall discovered photos taken in 1890 by J.W. Taylor showing that the lobby arches, columns, and inglenook ceilings of the dress circle lobby were originally treated with intricate stencil designs. With these findings, we reached out to our trusted restoration partner Historic Surfaces to gain a more historically accurate understanding of this interior. Now we are working to install the intricate Louis Sullivan stencil designs that once covered The Elissa Lobby. The next time you visit the theatre, please stop by The Elissa Lobby on the second floor to see our progress. 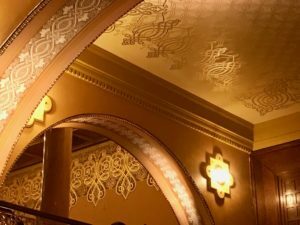 We hope you are just as inspired as we are to see another piece of the Auditorium Theatre restored to its original glory. Restoration Never Rests! Restoration and preservation are ongoing efforts. Consider making a gift to our Restoration Fund today to help us continue our work to bring back the original splendor of the National Historic Landmark Auditorium Theatre.